PIETA. 1999 – 2000. Gerlesborg, Sweden. Experience that is wholesome and not dissected into fragments – representation of lives of other people and of own life comes to make a unified image and supplies an example of compositional thinking for the sake of the plastic. For one, this includes the previously realized desire to generalize in a single unified composition the main Evangelical themes. The composition must emerge as a materialized prayer, the Formula of Life understood as the «Bearing of the Cross», where the act of the Crucifixion is the culmination. But what for is this repeated in the life of every human being? The answer is provided by the subsequent «Taking from the Cross» and the «Resurrection-Ascension»: for acquiring Eternal Life. The Evangelical themes that take place in time exist simultaneously in the plastic, just as they exist in Eternity, and they turn into the formula of Sacrament – a prayer. 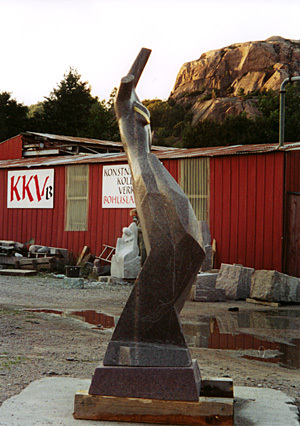 This is how the composition «Mystery» appeared in 1997-98 (granite, height 3.2 m, town of Hunnebostrand), it was performed at a symposium in Sweden. The plastic of the «Crucifixion» became the central theme in it. The subjects of the «Bearing of the Cross», the «Taking from the Cross» and the «Ascension», which all of them were equal from the point of view of content, received reserved spatial development. In the next attempt at trying to express the plastic monolith of the mystery of the New Testament there emerged the need for making weaker the attention accorded to the «Crucifixion», for greater stressing of the dramatic character of the mutual flowing of the forms in the themes of «Taking from the Cross» and «Pieta», and for making the accent on the human component of all those subjects. (PIETA, granite, height 2.3 m, town of Gerlesborg, Sweden. 2000-2003). The fact that the events take place simultaneously results in their combination in our conscience where they come to take gradually the same mental space. 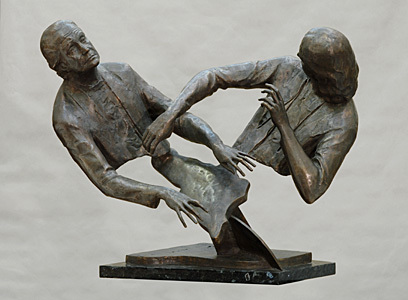 Thus, for example, take the images of the performers in sounding of the musical ensemble (the «Duet, M. Voskresenskiy and A. Knyazev”, bronze, granite, 2000). The composition portrait seems to be the most promising genre on the road to acquiring synthesis in the contradictory process of culture. In addition to the proper valuable sense, the work with the model begins to acquire a growing conceptual character. («Galatea», bronze, granite, 2000). The drawing from nature makes a study of the same spatial situations that a sculpture does. (The drawings of the 1990-es).